For companies considering social collaboration technology but looking for proof of hard ROI and payback, a major new study offers compelling evidence. A leading global business consulting firm analyzed results from several hundred Jive customers and found top- and bottom-line impacts that would make any CXO take notice. 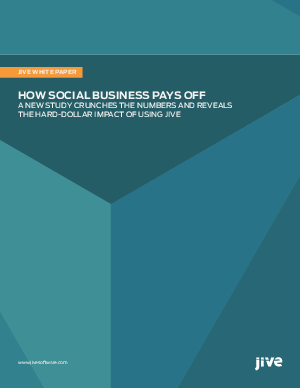 On average, Jive’s social business solutions helped companies increase employee productivity by 15% and drive 2-4% incremental top-line value annually.